Our plastic extrusion screen changer in the production process to ensure uninterrupted data flow and does not interrupt production, to achieve a large filter area, to meet customer demand for higher capacity, the better the quality of production, and is especially suitable for the production of cast films and pipes, plates, sheets and other products. 1, special sealing structure design (patented technology), the effect is good, guarantee five years without leakage. 2, double channel filter, for the network without stopping, no leakage, no interruption of production, increase energy saving without waste. 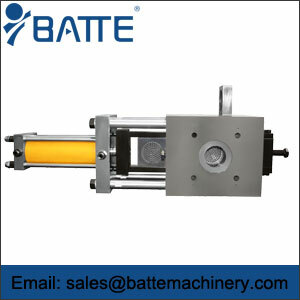 Especially suitable for cast film, sheet and plate production. 1, and various types of imported or domestic extruder and melt pump matching, used in the production of granulation, pipe, plate, sheet, cast film, etc products. 2, and various sols, adhesive, coating and other products of the mixture production line matching, for material blending filters, without stopping the machine filter replacement.